COMPANY PROFILE State Bank of India provides banking and financial services to corporate, commercial, institutional and individual customers in India. It also provides online and international banking services. State Bank of India, or SBI, is India’s largest bank with INR 20.5 trillion in deposits and INR 17.3 trillion in advances. The bank has an extensive reach in rural and semirural areas, with 66% of its market-leading 16,300 branches in India located in those regions. As of March 2015, over half the bank’s advances were made to corporations with a focus on the infrastructure and iron and steel sectors. The bank is majority-owned by the Indian government, with a 61% stake. 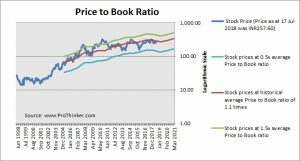 At the price of INR257.60 as at 17 Jul 2018, State Bank Of India is trading at a Price to Book Ratio of 1.0 times current book value. 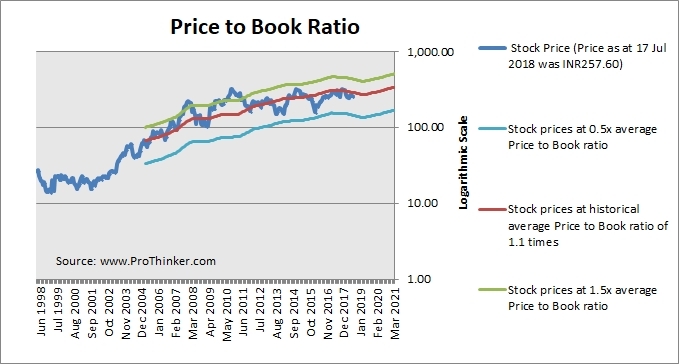 This is a 11% discount to its historical average Price to Book Ratio of 1.1 times.